The tour of Palazzo Steyn, home of Carolyn and Douw Steyn, with designer Stephen Falcke and architect Wynand Du Plessis is here. If you’re going to Christen your home a ‘palazzo’ it better look the part. Not since the original Italian country mansions which inspired it, has ANY building lived up to its title quite so well as Palazzo Steyn does. 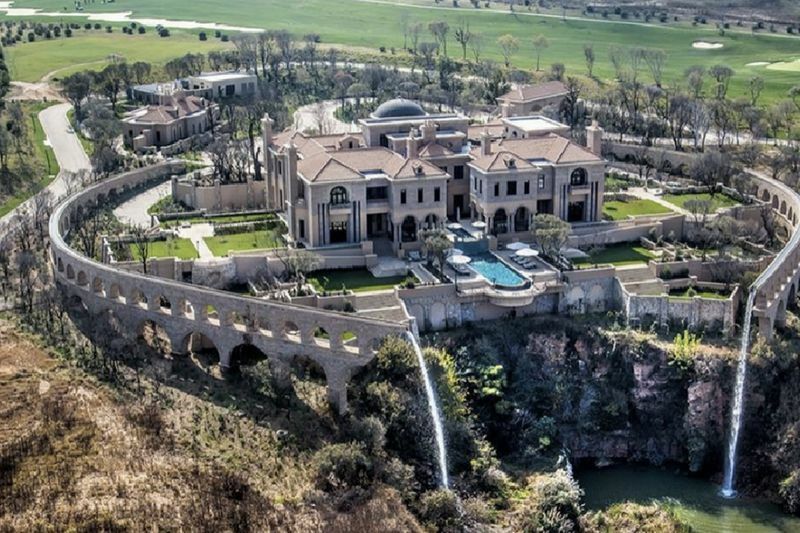 The eight hundred hectare Steyn City development in Johannesburg, South Africa looks over an area five times as large as Monaco and yet the lady of the house manages to make a visit here feel quite personal. Excess irrigation water from the Jukskei River gets released back into the river and around the property, while eighteen boreholes and closed-loop geothermal heat pump systems were installed. The natural energy from these is used to power the heating and cooling systems of the house. This villa is extremely green beneath its classic Palladian architecture. Sandstone from two quarries in Naboomspruit was used for the external walls and, once inside, the solid Carrara marble staircase is a showstopper. Marble for the patterned floor was sourced locally, solid African hardwood was used in the doors and windows and all around you is the work of the best South African artisans. Take a look at the full video in which Top Billing got an exclusive look into the grand Steyn Palazzo mansion.